Dividers helps to keep contents of Hulk containers in order. Can be cleaned using standard cleaning products. Divider is resistant against rust and corrosion. Clear front windows increases Hulk container's capacity. Clear window provides quick view of the bin contents. Made out of clear injection molded crystal styrene. 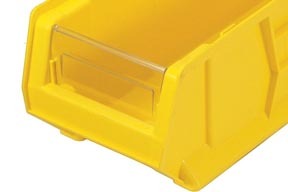 Divider is designed to be used with Hulk containers. 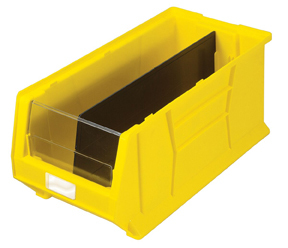 These containers are used for storing large items and the interior can be separated using dividers. 21-1/4 x 6-1/4 x 1/4"
21-1/4 x 8 x 1/4"
21 x 9-1/4 x 1/4"
21 x 10-1/4 x 1/4"
21 x 11 x 1/4"
28-3/8 x 6-3/4 x 1/4"
28-3/8 x 9-3/4 x 1/4"
28-3/8 x 10-1/4 x 1/4"
28-3/8 x 11-1/4 x 1/4"
28-3/8 x 14-1/4 x 1/4"
36 x 17-1/2 x 1/4"
6-1/4 x 4 x 1/4"